Discussion in 'Amps and Cabs' started by TaronKeim, Jun 24, 2008. Hey fellas, I know a few of you on the board have the Viceroy (or Vincent). I'm looking for an amp with killer cleans and edge-of-break-up tones... which is what I've heard the Viceroy excels at. However, I've heard Carrs are a little loose in the bottom and I can't have that. I need a very tight bottom that can handle a guitar with a large sonic footprint without sounding boomy. I play a 7-string, so I need the low-end to hold up through-out the gain range and at any volume. Will the Viceroy do this? Has anybody tried it with 10 inch speakers for improved bass handling? I'd say the Viceroy would'nt work for what your after. 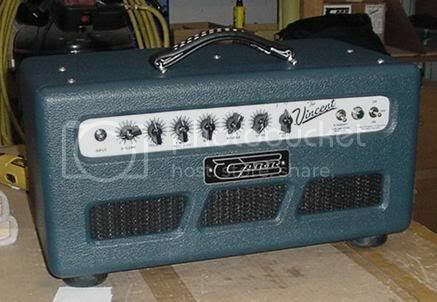 I find Carr amps tend to have a lot of low end and tight doesn't fit the description. Not flubby but not tight. I think you should seek out and play one. I am sure if you emailed Carr you'd probably be able to find one near you to try out. I own several boutique amps(including the Vincent) --- and the (Vincent/Viceroy) is usually the first amp I grab for a small gig or rehearsal. I sold mine --- (don't ask) --- and I ended buying another one. Great amp in a very small package. They are great amps,and they will stay tight without loosing that nice bottom,They are not boomy,never played a 7 string through mine,but I use a 54 low E string and it sounds very focused,The early Kingpin speakers where a little looser on the bottom,but they dont use those any more. Well I don't have Viceroy/Vincent, but my El Moto has Kingpins, and have never found it to be loose in the low end. Like others have said, if you can, you should definitely give Steve a call(and try to play one if possible). Maybe the Vincent and the Mercury I had were the only made with a non tight low end.... A 7string through an open back Carr??? Try one. and make uo your own mind. A 7 string needs to get good LOW (40-50hz) bass response so I'd imagine a Viceroy head with a closed back cab would be the way to go. I love Carr amps. I own a Slant 6V and a Rambler and have auditioned the Viceroy a bunch. The bass control voicing on Carr amps is pretty beefy so I suspect it is overused by a lot of folks. On both my amps at higher volume levels I have the bass set VERY low when using HB's or fat P-90's. It's tight and very well defined. Crank it up and everything turns dark & muddy. I`d imagine the first frequencies to break up "on the edge" would be the bottom ...Is this possible ,,, edge of breakup with a solid bottom ? Might take some test driving . I like the looks of the Juke 1210 up for sale here ... Should have the goods down low . Also remember -- you can get the Vincent/Viceroy as a head (tiny - it weighs nothing) ... and you can use with any cab you want. I played the head/cab combo at Black Creek and it sounded killer.